New Dr.Blowhole DVD! and real Jazzy!. I got the Dr.Blowhole DVD today! Oh,and that's my OC Jazzy XD. HD Wallpaper and background images in the पेंग्विन्स ऑफ मॅडगास्कर club tagged: penguins of madagascar skipper kowalski private rico penguins dr.blowhole jazzy oc. This पेंग्विन्स ऑफ मॅडगास्कर photo might contain डिब्बा बंद मांस, डिब्बाबंद मांस, टीनयुक्त मांस, tinned मांस, मोबाइल फोनों के लिए, हास्य पुस्तक, मंगा, कार्टून, एनीमे, कॉमिक बुक, and manga. ^ It came out today! :D It has The first Dr.Blowhole AND the two part special! ^ It has no new episodes :( Just the first Dr.Blowhole episode and the two-part episode. Nice. My copy shipped, but I haven't gotten my flippers on it yet. Nice idea to include Jazzy in the picture. As for the dvd Yeeppieee!!!!!!!!!! :D But I dont know if it has came out in England so I'd better check. I SO WANT THAT DVD!!!!!!!!!!!!!!!!!!!!!!! How is it "New-to-DVD"? 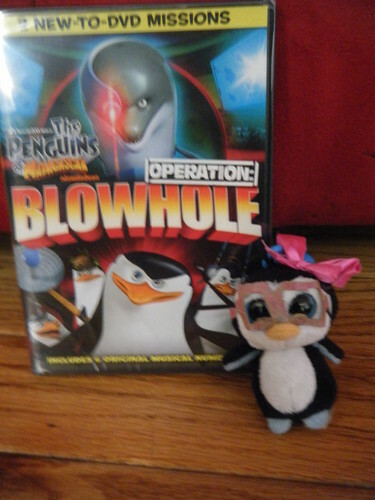 The first Blowhole special came out on the first DVD??? Nick cares so little about Pom, they don't even bother checking the packaging on the DVDs! ^Yeah, but it's still one "mission".